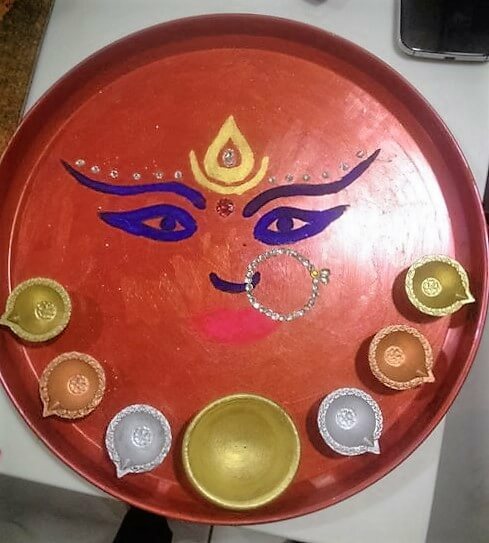 Discover beautiful Navratri aarti thali decoration ideas to try this festive season. You can also use them to make pooja thali during Durga Pooja. Make them and win prizes in competitions; many of them are already winners from various competitions. Navratri comes from a Sanskrit word which means ‘nine nights’. This festival is celebrated to worship the nine forms of Goddess Durga. The festival is celebrated all over the country with immense zeal and enthusiasm. Aarti is an important ritual in any form of pooja in the Indian culture and it should be performed with devout religious feelings towards God. Here are few amazing Navratri aarti thali decoration ideas to make the festival special. These attractive Navratri aarti thali decoration ideas kindle the religious fervor in the atmosphere. 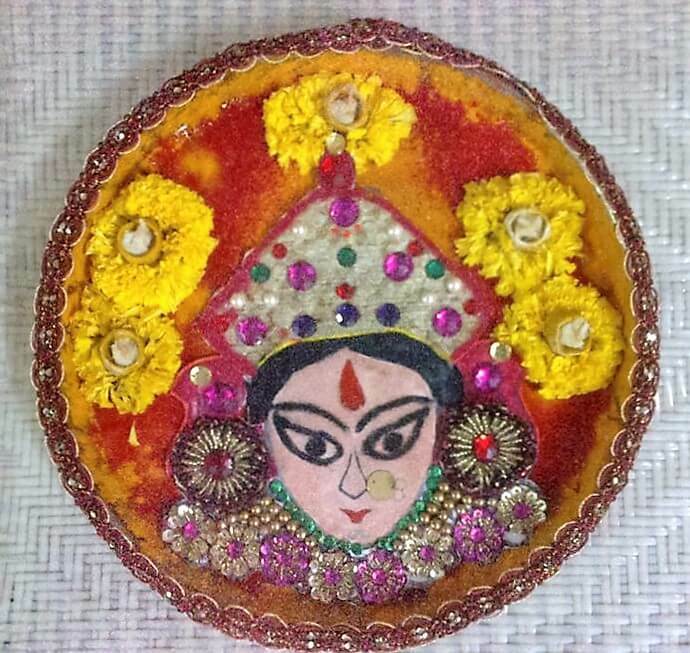 You can make a cut out of Goddess Durga and stick on the aarti thali and then decorate it with flowers, rangoli colors and rhinestone. Stick a pretty lace on the edge of the thali to give the glittery effect. Place the diyas made of dough in the center of the marigold flower petals. 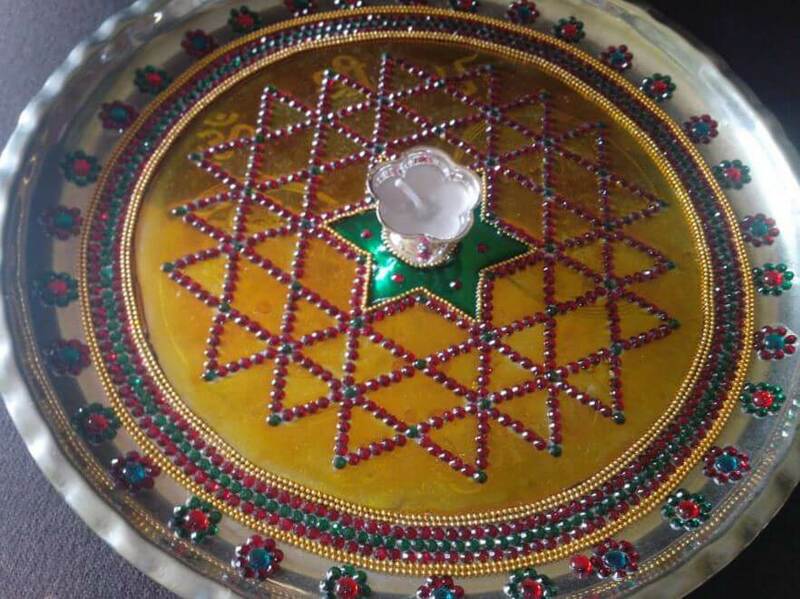 This aarti thali carries a glimpse of Garba, the traditional dance form of Gujarat. 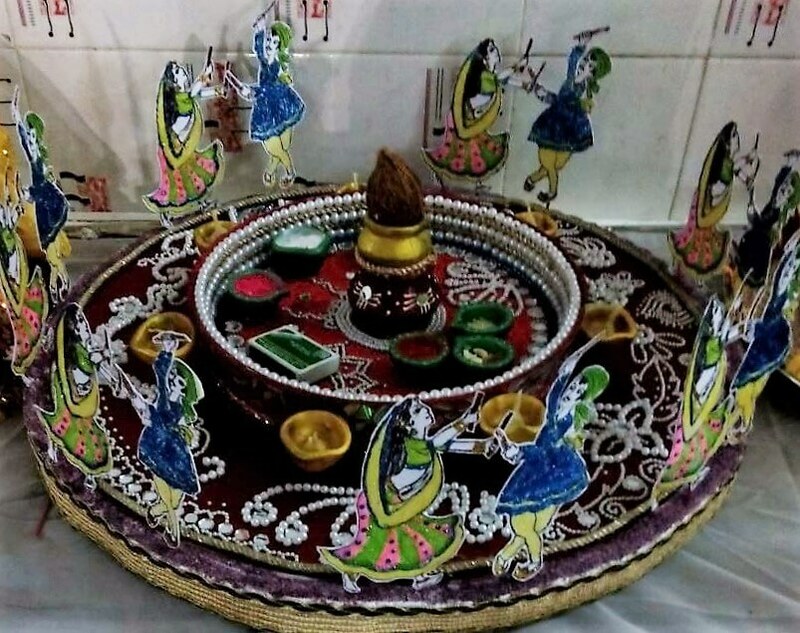 Traditionally, Garba is performed around a clay lantern with light inside it and this aarti thali is almost successful in depicting it. You can put real grass or even crêpe paper cuttings to give the green effect. Make dolls using betel nuts and cashew nuts. Add yellow color to the rice using turmeric powder to make the inner circle look colorful and bright. These amazing Navratri aarti thali decoration ideas force us to contemplate a trip to West Bengal. Durga puja or Navratri is one of their major festivals and is celebrated with great pomp and show. Knead the flour to make a smooth dough and put it on the thali to make the base. Add red colour to a small portion of the dough. Entwine it with the plain dough to make the edges of the aarti thali. 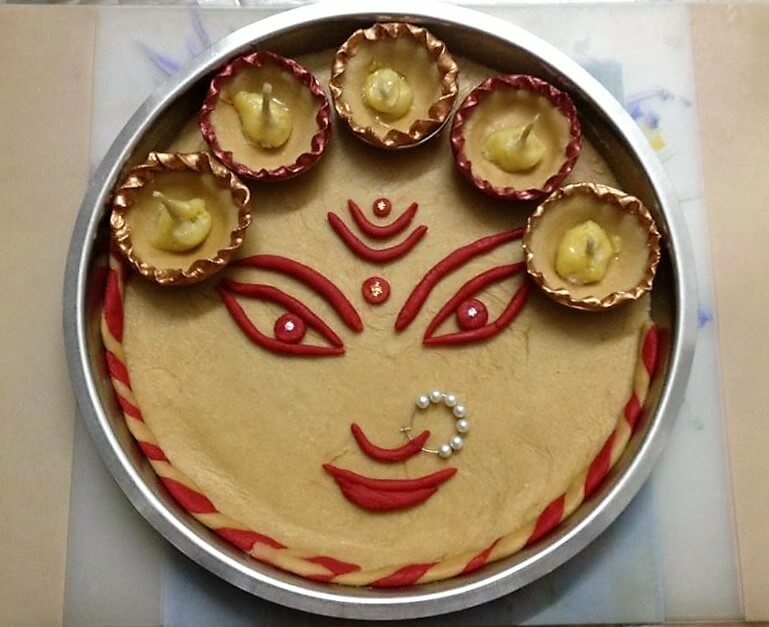 Make the features of Maa Durga using the red colored dough. 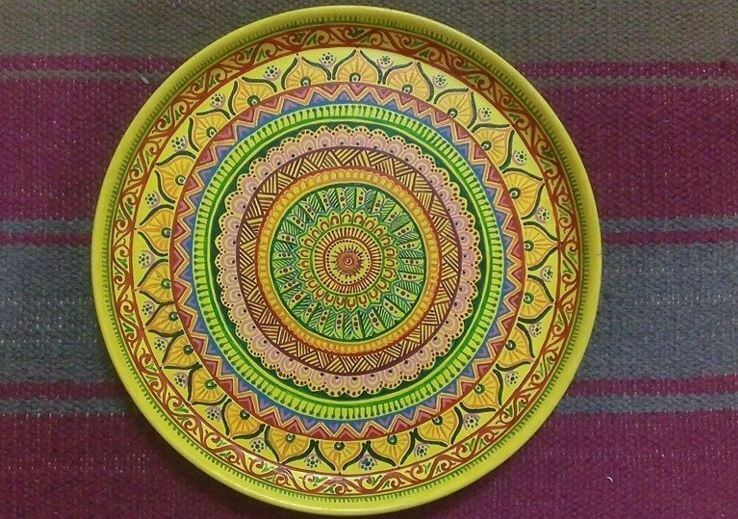 Make the diyas using small bowls as the base and paint the dough in acrylic colors to make the edges. This exotic aarti thali showcases the flavour of the festive occasion in Gujarat. Fix the cut outs of the couples playing Dandiya along the edge of the thali. Do up the base using velvet paper, decorative laces and beads. Put a terracotta kalash with coconut in the center to give it a traditional look. Place terracotta diyas filled with ghee and light it when the time to offer the puja comes. 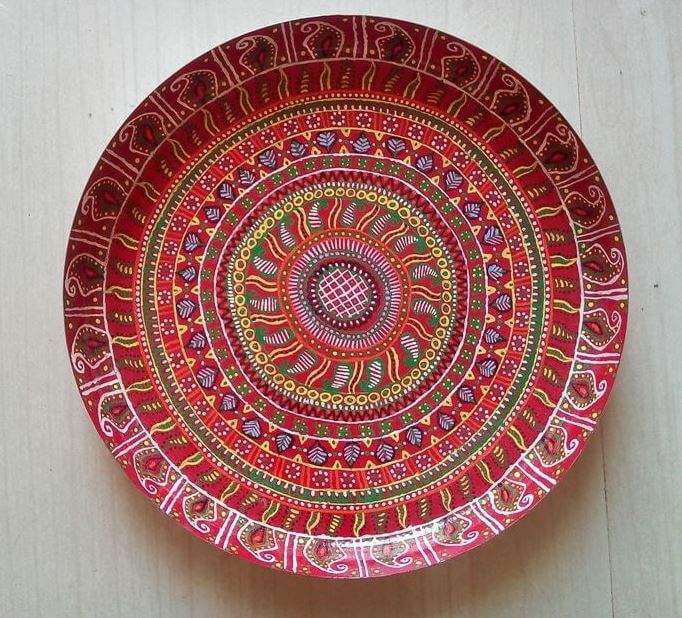 Here the thali is painted in red acrylic color. The features of the deity is painted in blue and decorated with rhinestone. Color the terracotta diyas in attractive gold, silver and bronze paint. Such Navratri aarti thali decoration ideas are simple yet appealing. 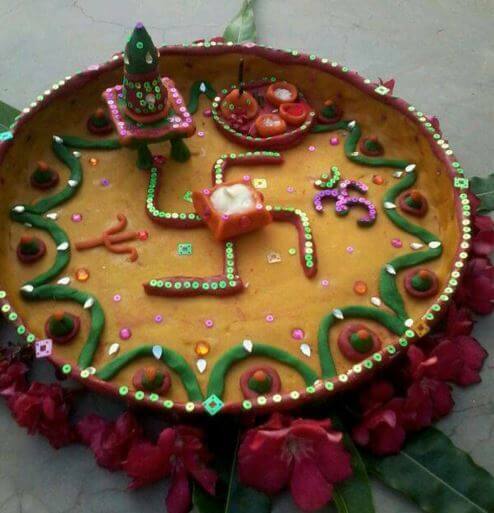 Look at this beautiful aarti thali decoration. Paint the face of the deity in the center of the thali and decorate it with small rhinestone. 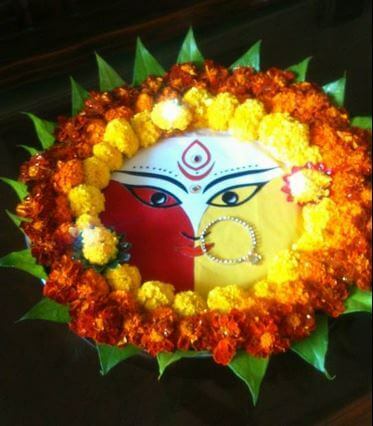 Put marigold flowers around the deity and place the betel leaves intermittently. Betel leaves are considered to be auspicious in Hindu religion and most of the time it is used in different forms of puja. Check out this delightful aarti thali decoration! Do up the thali using food grains. Ganeshji carved out in the center is adding more this exquisite idea. Lord Ganesh is considered to bring in peace and prosperity by removing all kinds of hindrances. This looks like a beautiful wooden cut out of aarti thali. 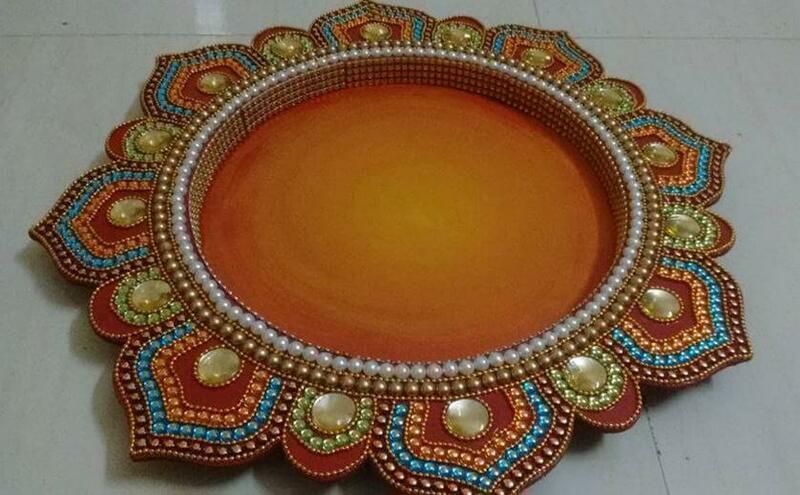 First paint the thali attractively and then decorate it with beads and rhinestone that come in various colors. Place the diyas in the center and you will be mesmerized to see the entire thali glowing. Stick colorful and decorative lace along the edge as well as the inner circle of the aarti thali. Make a star pattern in the center. Adorn it with red and green rhinestone and beads. Place a silver diya in the center and this will create the magic. These Navratri thali decoration ideas are innovative and artistic as well. The terracotta aarti thali is decorated with Kalamkaari painting. Kalamkaari is an ancient Indian art form that originated in southern India. The patterns are created in beautiful colors. Illuminate the aarti thali with diyas and it will look enchanting. This terracotta aarti thali is decorated in traditional Kalamkaari art form. Almost all the nine colors of Navratri are used in the patterns. Put brightly colored diyas on the thali and offer aarti. Here is a simple yet alluring aarti thali decoration. Use glue to stick the lace on the edge. Stick chart paper to create a colorful base of the thali. 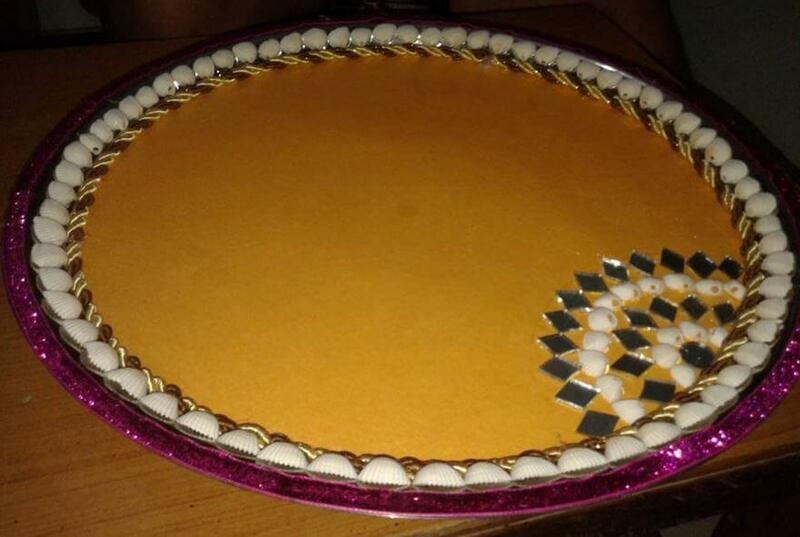 Use shells and decorative thread to decorate the inner circle of the aarti thali. Create a beautiful pattern on one side using mirrors and shell. 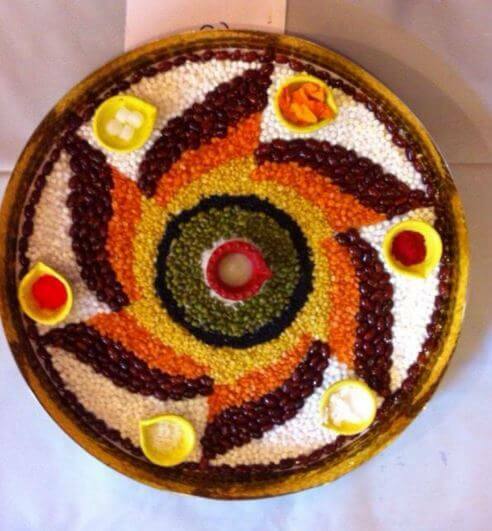 Use food grains to create this awesome design on this aarti thali. Place a bright colored diya in the center filled with ghee for performing aarti. Also, place some diyas around the thali with the essentials of the pooja. 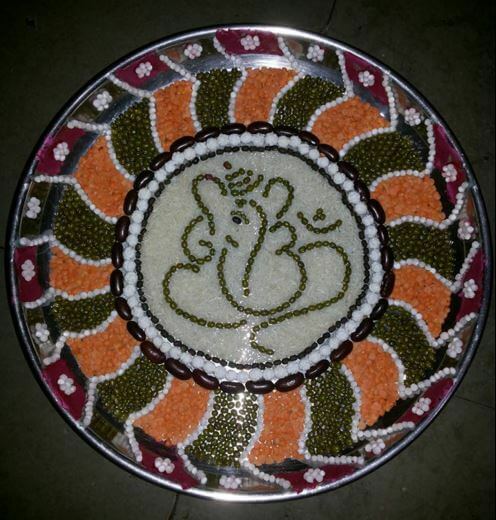 Look at this wonderful aarti thali decoration! Adorn the edge with a golden ring. Use glue to stick it firmly on the circular base. Use satin ribbons to make roses. Stick them along the sides making the aarti thali look attractive. Make the paisley patterns with rhinestone and beads. 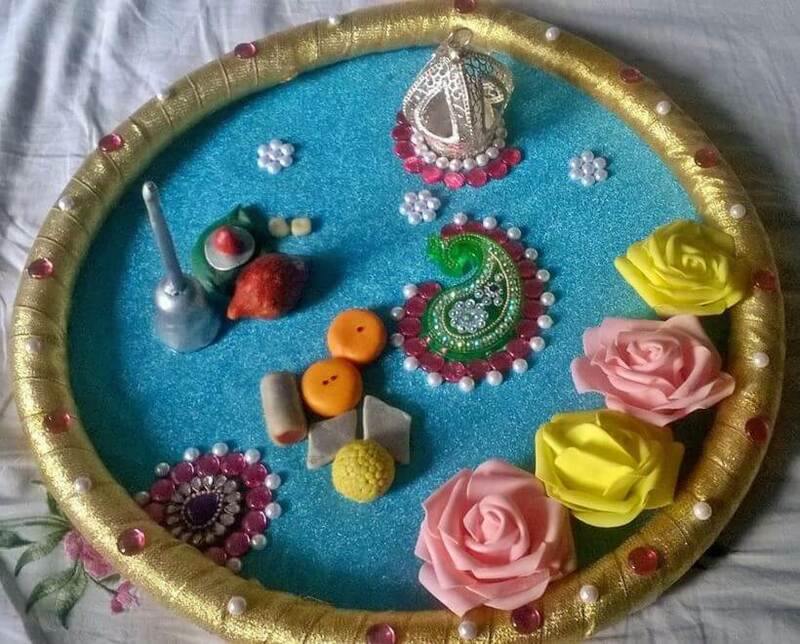 This awesome aarti thali seems like a child’s creation. Do up the base with dough and adorn it with sequins. Color the dough in different colors to make the patterns. Use the same dough to make diyas to keep the things used for the pooja and aarti. 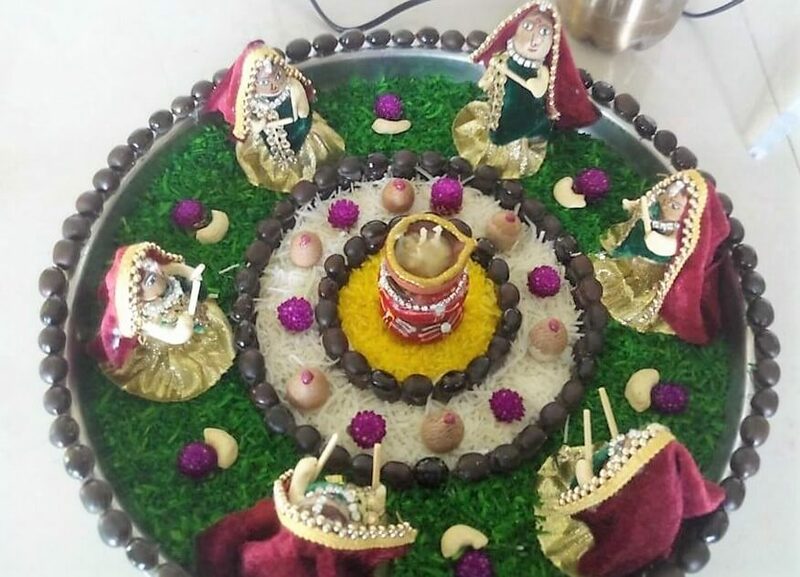 This entry was posted in DIY Crafts, Pooja Room and tagged Aarti ki Thali, Aarti ki Thali Decoration, Aarti Ki Thali Decoration Ideas, Aarti Thali, Aarti Thali Decoration, Aarti Thali Decoration Competition Ideas, Aarti Thali Decoration for Competition, Aarti Thali Decoration for Dussehra, Aarti Thali Decoration for Navratri, Aarti Thali Decoration Ideas, Aarti Thali Decoration Ideas for Competition, Aarti Thali Decoration Ideas for Durga Pooja, Aarti Thali Decoration Ideas for Navratri, Aarti Thali Decoration Pictures, Aarti Thali for Navratri, DIY Pooja Thali, Durga Puja Aarti Thali Decoration, Durga Puja Aarti Thali Decoration Ideas, Dussehra Aarti Thali Decoration, Dussehra Aarti Thali Decoration Ideas, Dussehra Pooja Thali Decoration Ideas, Handmade Pooja Thali, How to Make Aarti Ki Thali, Navratri Aarti Thali Decoration, Navratri Aarti Thali Decoration Ideas, Pooja Thali, Pooja Thali Decoration for Competition, Pooja Thali Decoration Ideas, Pooja Thali Decoration with Flowers by Preeti Sinha. Bookmark the permalink. Why dont we see more 3 dimensional aarti thalis as decoration items for navratri? It quite literally adds another dimension to the look!